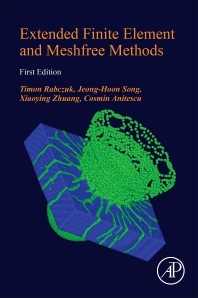 Extended Finite Element and Meshfree Methods provides an overview of, and investigates, recent developments in extended finite elements with a focus on applications to material failure in statics and dynamics. This class of methods is ideally suited for applications, such as crack propagation, two-phase flow, fluid-structure-interaction, optimization and inverse analysis because they do not require any remeshing. These methods include the original extended finite element method, smoothed extended finite element method (XFEM), phantom node method, extended meshfree methods, numerical manifold method and extended isogeometric analysis. This book also addresses their implementation and provides small MATLAB codes on each sub-topic. Also discussed are the challenges and efficient algorithms for tracking the crack path which plays an important role for complex engineering applications. Timon Rabczuk is Professor of Modeling and Simulation, and Chair of Computational Mechanics at the Bauhaus Universität Weimar, Germany. He has published more than 250 SCI papers, many of them on extended finite element and meshfree methods. He was listed as one of ISI’s Highly Cited Researchers in 'Computer Science' and 'Engineering' in the years 2014, 2015 and 2016. Jeong-Hoon Song is an Assistant Professor of Civil, Environmental and Architectural Engineering at the University of Colorado, Boulder, USA. He received a Ph.D. in Theoretical and Applied Mechanics at Northwestern University under the supervision of Dr. Ted Belytschko. He has published over 40 SCI papers in the areas of the extended finite element, extended meshfree and point collocation methods. Xiaoying Zhuang is an Associate Professor at the Institute of Continuum Mechanics at Leibniz Universität Hannover, Germany. She has been developing computational methods for two-dimensional and three-dimensional fracture problems using partition-of-unity methods including meshfree methods, the extended finite element method (XFEM), the phantom node and finite cover method, multi-scale methods. She is on the editorial boards of international journals including Theoretical and Applied Fracture Mechanics, KSCE Journal of Civil Engineering and Engineering Geology. Cosmin Anitescu is a researcher at the Institute for Structural Mechanics of the Bauhaus Universität Weimar, Germany. His research focuses on the theory and application of extended finite elements, meshfree methods and isogeometric analysis to engineering problems. He is currently the main contributor and maintainer of IGAFEM, an educational software package written in Matlab for solving computational mechanics problems.